As a property manager, you know the importance of maintaining a healthy and attractive landscape. Yet, you don’t have the time or the budget to source and hire various providers to meet your landscaping and property maintenance needs. From design and execution to maintenance and enhancements, Meadow Green Landscape can handle it all. We offer a broad portfolio of custom plans to help you maintain a beautiful property all year long. 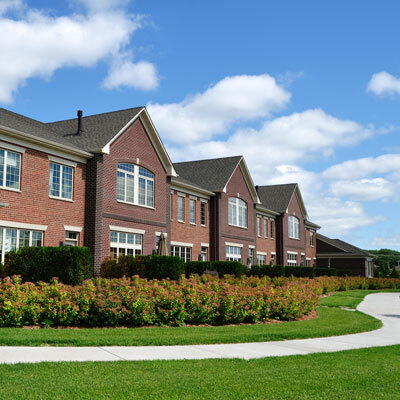 Our licensed, certified teams work with corporate campuses, industrial facilities, commercial offices, residential communities, multi-family dwellings and municipalities in the Twin Cities area. Caring for plants, trees and shrubs requires years of experience and attention to detail. Our certified nursery and landscape professionals are equipped to help you create dynamic gardens that catch the eye all year long. A perfectly manicured lawn sends a message of consistent high quality to everyone who visits your business. Meadow Green will help you make that a reality with fertilization, weed control (including non-turf areas) and grounds mowing and lawn care. We utilize the latest equipment to ensure your lawn always stays lush and healthy. Our irrigation experts will help keep your irrigation systems in top shape so you are using water wisely. We’ll handle every aspect of your irrigation system, from installation, repair and maintenance to winterization and start-up. When the seasons change in spring and fall, landscapes and lawns tend to get messy. We’ll handle the leaves, branches, debris, weeding, pruning and more, restoring your property back to its spotless beauty. When winter storms hit, it’s good to know you have a provider who will be there to help you through it. From timely snow and ice removal to tree care and property maintenance, Meadow Green will help you get back to business as usual after the storm.